Twisted trunks of Tanche olive trees, their leaves sparkling like silver in the warm soleil de Provence, bear buds of ripening promise for the fall. Tree-ripened olives will go to the mill to be crushed, oozing into delicious, rich huile d’olive. Not many people know about the olives and olive oil from the beautifully quiet and wind-swept groves of Nyons. The area is the northern-most olive-growing region in the world – in effect the “North Pole” of olive groves!! Protected by mountains on three sides and spread over some 50 communes, over 228,000 olive trees have produced fruit here for centuries. The wrinkly black Tanche olive and its oil were the first of their kind ever to obtain an AOC, Appellation d’Origine Controllée, a prestigious identification that ensures the quality and origin of a product. Like a fine wine, regulations dictate that, in order to receive an AOC label, a bottle of olive oil must pass a blind test tasting. 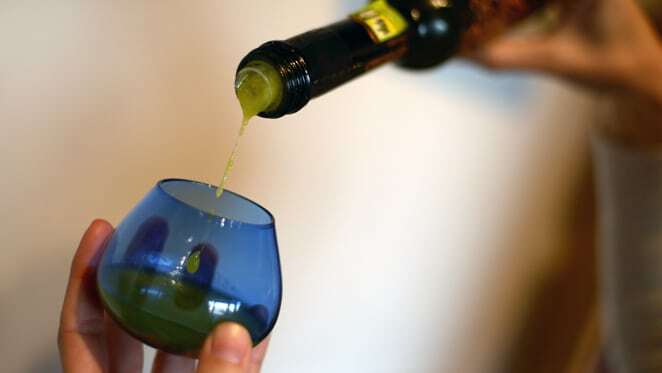 The oil is poured into small opaque blue glasses – this way the “tasters” are not swayed by the varying colors of the oil. Instead, their senses of smell and taste search for marked characteristics specific to oil pressed from the Tanche olive. The “tasters” cup their hands around the bottom of the glass to warm it and gently swirl the liquid. The aromas from the warmed oil give a scent of apple and freshly cut grass. The feel in the mouth is buttery, the taste a combination of hazelnut and almond. Because it’s made from mature olives, there should be no hint of bitterness. If the oil passes the test, voilà! it receives the AOC designation to be sold as “Huile d’Olive de Nyons” and can be purchased in stores throughout France. The Institut du Monde de l’Olivier is open to the public, so a visit to Nyons is a must when you’re in Provence!